Poll: Which method of showing a wide FOV looks better? Minecraft lets us have a field of view (FOV) up to 120deg, which it splits up over however many pixels/screens we have available with our hardware, which is great, but it does this by projecting the curved FOV onto a flat image (which we then either show on a single screen or split into multiple screens). Unfortunately this projection causes MASSIVE distortion near the edges of the flat image. And here's a diagram of what's happening: the black curved FOV is projected onto the flat purple image (this purple image is what we then display on our screen or screens). 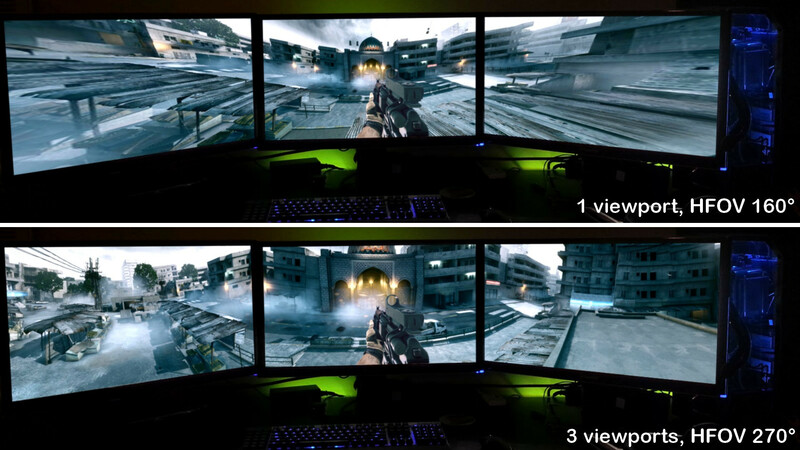 Most games offering a wide FOV do the same, but there's a far better option: the large FOV can be split into three smaller FOV. 120deg can be split into 3 x 40deg, and then each of those smaller FOV can be individually projected onto a flat image, and finally those three flat images can be tacked together to create the one large image we display on our screen(s). This is like having three people with 40deg FOVs standing on the same spot looking outwards at angles than cause the edges of their vision just touches that of the others, then combining their view into one. Because projecting a curved 40deg FOV onto a flat image creates much, much less distortion than projecting a 120deg FOV onto a flat image, the final result is far superior. This is three 40deg views joined edge to edge. If you look carefully you can see the two joints where the three smaller images are tacked together - there is a little distortion around the edges of the three sub-images (this is impossible to avoid entirely when projecting something curved onto something flat). You can see the huge difference in quality. This method does of course mean there are three vanishing points in the image instead of one, but this really isn't significant, and if the player is using three monitors is actually a positive: when he turns his (physical, real world) head to look at one of the side screens he sees a vanishing point directly in front of him, as he should. Do you agree the 3 x 40deg (the bottom image) is superior to the 1 x 120deg one (at the top)? One of the reasons I'm proposing using multiple viewports rather than a new projection method entirely, is because I think the multiple viewports is probably something that is moddable: a modder could implement it (I'm assuming). I have a computer science degree, and would look at doing it myself, but I'm in the final semester of another degree right now, so have no time available at all. I think a very promising area to look at is the multiple viewports for spiders and especially withers in spectator mode in 1.8. The wither's three heads each get their own viewport displayed on screen, so I feel extremely confident that this mechanism could form the base of a mod to give multiple viewports to a player's view in a mod, giving the result I've described and pictured in the OP. Does anyone have a spectating screenshot from inside a wither in 1.8 that they could post? I found one for a spider (below), but I'd really like to see the wither one. Huge FOVs make things stretched out. With this, it looks much better. The flaw is that not many people have that wide monitors. It makes no difference whatsoever how wide your monitor is, or how many screens you have, or what resolution. You can have 120deg with one small screen (I do), but if it were changed to 3 x 40deg on that same screen you'd still see the same total FOV (120deg) but you'd get rid of almost all the distortion. The only downside to doing this with a single monitor is you get the two seams running down the image where the sub images join, and a vanishing point in each sub-image. It's best (perfectly, actually) suited to three screens, but even on one screen the flaws are much less severe than the current distortion, IMHO. Since I don't have any idea how this would actually look, I can't give an informed answer on if I support it or not. if this would make Minecraft look better, without causing a huge drain on your graphics card, I give my support. I'd have to disagree, the side monitors are ridiculously stretched out so much that you can't make out anything on them at all. And that is looking at them from a distance, if you were actually sitting at the desk it would be worse because your natural FoV would stretch and distort things even further. The point of having the 3 viewports is to give you a clear image and let your peripheral vision distort the image the way it naturally does. Using a single viewport distorts the side images so much there isn't even a real point in using it. But the 3 viewpoints don't connect well and look like different places. That is a monitor issue, not a game issue. The edge of the monitor (the bezel), is thick on each monitor which causes the appearance of looking at 3 different things, but only at a distance. If you are sitting at the desk and focusing on what you are doing (in games or just regular use), your eye compensates and you can't see the gaps well, if at all. I've been using a 3 monitor setup for 4-ish years now and the monitors have 3/4 inch bezels, giving me about a 1.5 inch gaps between each screen. Unless I'm thinking about them, I don't even realize they are there. Rectilinear projection looks good, although it also stretches a bit. The other three all cause some serious distortion, I don't really think they're ideal. Thanks for the examples you posted, awesome! The number of monitors pixels is irrelevant though: going from the current 120deg on 1 monitor to 3x40deg on one monitor still give the same image improvement, relatively. It is better suited to 3 screens though, because the screens "hide" the seams between images.
? I posted examples in the OP. Fisheyez has posted more since. Not everybody is going to run out and buy an extra 2 monitors. Which is irrelevant. The game already supports multiple monitors better than a lot of games, so suggesting that it support it in a better way is a completely reasonable suggestion. Just because not everyone has or will get 3 monitors doesn't mean it shouldn't add support for it. Trying to only satisfy the bare minimum is a really good way to make a really crappy game. This won't make the game extra amazing, but it hurts nothing. this would increase the view range of a player, which would not be very good. GENERATION 38: The first time you see this, copy it into your signature on any forum and add 1 to the generation. This is a Social experment. look at how the clouds are at very different angles where the seems are. I Found that very noticeable and therefore do not support. Yea. those DO look better than the original. Support! The clouds don't match up because for the example image I had to manually take three screenshots, and join them together. The clouds kept moving between each screenshot - of course they don't match up. It wouldn't be an issue if the three sub-images were all being rendered at the same time. Is no-one able to post a screenshot of spectating from a wither in a 1.8 snapshot?